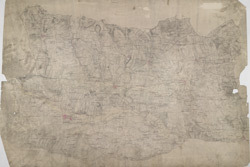 This drawing is very worn with some areas missing. The Ordnance Survey Letter Book notes that Mr Budgen was to be at Dorchester "on a new piece of work on the 29th Day of this Month", allowing us to be fairly certain of the authorship of this drawing. Maiden Castle - at 47 acres the largest iron age hillfort in Europe - is marked in the bottom left. The lines describing it follow the actual shape of the earthworks.